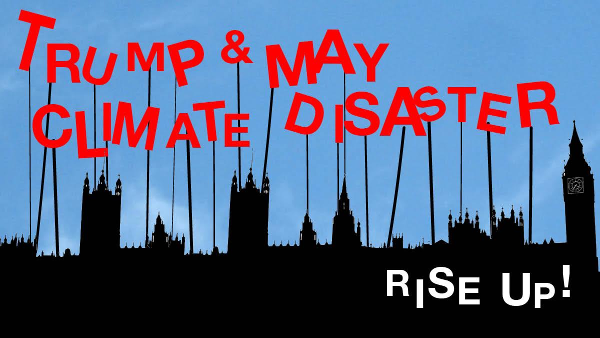 Trump and May, Climate Disaster: Rise Up! In the UK, May's government are continuing a programme of climate action cut-backs, while pushing through damaging infrastructure such as fracking and a third runway at Heathrow. In the US, Trump is slashing funding for climate science and preparing to force through disastrous projects such as the Keystone XL and Dakota Access Pipelines. Thanks to all who turned out to our protest - calling on Theresa May to stand up for our climate as hundreds of thousands protested in the US about Trump's climate-wrecking. Find out more about the UK's less than perfect record on climate change in the video below. Read coverage of our protest in DeSmogBlog with pictures of the day here and here. And of course this was just part of a global action with hundreds of thousands on the streets in the US and other countries. 4 / 6 May: Hear from one of the activists at Standing Rock. Thomas Lopez Jnr of the International Indigenous Youth Council will be attending film screenings - 4 May in Liverpool, 6 May in London. 11 May: London screening of The Bentley Effect, a film about the battle against unconventional gas extraction in rural Australia. Fast-track the UK’s (overdue) climate change plan, showing clearly how we can get back on track both with our own Climate Change Act and commitments made in the Paris climate agreement. Rule out quick and dirty trade deals - with the US or any other countries - that sell out a safe climate and healthy environment or the rights of workers and consumers. Implement a fair deal for UK solar and onshore wind industries, reversing the damage done in recent years.